As long as there’s snow on the ground, you can snowshoe almost anywhere in Colorado where you’d normally take a hike. You don’t need to have years of training or spend much money, if any, if you’ve already got the gear (and rentals are very affordable). Whether you’re a free spirit or prefer to follow a groomed path, here’s a list to get you snowshoeing in Colorado's great outdoors this winter. If you have a freestyle mindset with no need for a guide, groomed trails or rental facilities, these areas offer plenty of options to create your own unique Colorado snowshoeing experience. • Rocky Mountain National Park: With 355 miles of hiking trails, Rocky Mountain National Park near Estes Park will be able to suit any fitness and experience level. Stop at any visitor center to get the latest snow and avalanche conditions and discuss the best path for your needs with the rangers. Rangers lead free snowshoe ecology tours October through March every Saturday, Sunday, Monday and Wednesday at 12:30pm. Reservations are required; call 970-586-1206. • The Colorado Trail: With 483 miles of trail stretching from Denver to Durango through six wilderness areas and eight mountain ranges, the Colorado Trail is perfect for charting your own course. You can access the trail from any of its 28 segments. • Grand Mesa: Near Grand Junction, snowshoeing atop Grand Mesa is spectacular. Check out the County Trail area, Ward trail head, or Mesa or Griffith lakes as a starting point. If you choose to snowshoe along the groomed Nordic trails, please walk next to, not on, the trail to avoid damage. • Nederland: Just west of Boulder, snowshoeing fanatics find nirvana in Nederland. Consider the Arapaho Glacier Trail if you’re ready for a challenge and the trail to Lost Lake for anyone looking for a manageable elevation shift with a stunning mountain lake at the pinnacle of your route. • Glenwood Springs: For a breathtaking jaunt in more ways than one, Hanging Lake Trail near Glenwood Springs climbs 1,000 feet for a good cardio workout, while the lake, falls and general beauty of the route will take your breath away. Take care, however, as the climb is steep and can be quite slippery. Back in town, the hot springs pool will be just the thing your aching muscles yearn for after a day snowshoeing. • Steamboat Springs: Experience the champagne powder the area is known for without battling the lift lines. Although Rabbit Ears Pass is probably the most well-known trail here, there are plenty of un-groomed yet well-traveled options in the area for all exertion and skill levels. If heading out into the wilderness and charting your own course makes your heart skip a beat, don’t fret! Choose to snowshoe under the professional guidance of a Colorado Nordic center or at a dude ranch. • Beaver Creek: The McCoy Park trail system is said to be Beaver Creek’s best-kept secret and features 32 km of groomed trails. • Breckenridge: 18 km of nature trails meander through old-growth spruce forests and Beaver Meadows. • Crested Butte: Check out the Sunday bistro breakfast or moonlight dinners at the Magic Meadow yurt; reservations required 48 hours in advance. • Eldora: Dedicated snowshoe trails and terrain for all abilities. • Keystone: Sign up for the guided Mountain Top Snowshoe Trek. • Vail Nordic Center: 10 km of separate snowshoe trails with magnificent views of the Gore Range. Read more about Colorado Nordic centers. Denver resident and owner/founder of Snowshoe Magazine, Ryan Alford, told us that Colorado’s dude ranches have given him some of his favorite Colorado snowshoeing experiences. 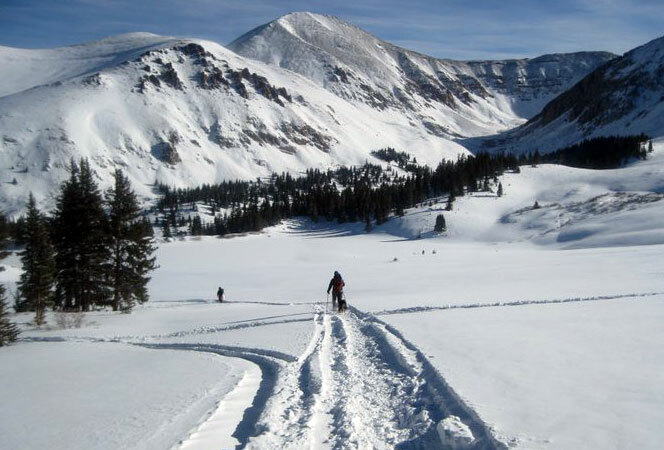 • Devil's Thumb Ranch: With 5,000 acres and 20 km of marked snowshoe trails at the foot of the Continental Divide in Winter Park, we bet you’ll agree with Alford that Devil’s Thumb Ranch has some of the “most pristine snow-covered backcountry snowshoe trails” in America. He suggests trying the full moon snowshoe and progressive dinner in February. The environmentally responsible ranch features rustic, yet luxurious accommodations, a spa, fine dining and lots of activities and stables too. • C Lazy U Ranch: “Great snowshoeing is what makes C Lazy U a wonderful winter destination that's uncommon but purely Colorado,” Alford said. Dedicated to providing families with the traditions of the American West in Granby, C Lazy U has first-class accommodations, gourmet dining, a spa and a commitment to “five-spur” service. Find other Colorado dude ranches.